War doesn't only take its toll on human lives -- dogs feel the high cost of conflict, too. Dogs in Israel and Gaza, terrified by the sound of sirens and rockets, are showing signs of post-traumatic stress disorder, Israeli newspaper Haaretz reports. Although veterinarians may deliberate the label of PTSD, there's no debate that the pets of war are feeling long-term effects of stress. "[The dog] was totally anxious, hyperventilating and couldn't sleep. Apparently he was having bad dreams ... When the dog's owner and his son came to me with the dog, they hadn't had a full night's sleep in two years. They had to do a tag team with the dog at night because he was so anxious." Although Dr. Ofra Gallily, an Israeli veterinarian and expert in animal behavior, doesn't quite believe that dogs get PTSD, she tells Haaretz, she does think "animals can certainly have post-trauma symptoms." Trauma can exacerbate problems with a dog's brain chemistry, she says, causing issues that last years. 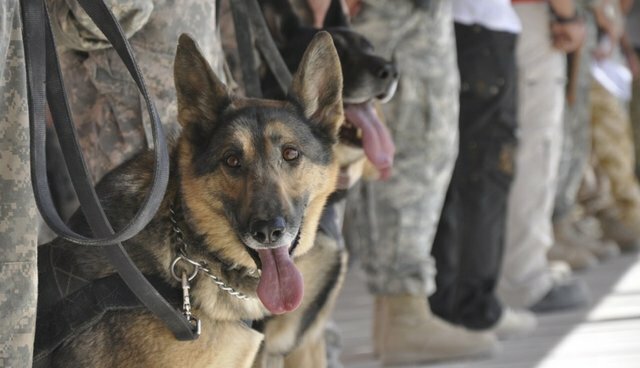 The United States Army even has an acronym for what their military dogs feel: CPTSD, which means, as you might suspect, canine post-traumatic stress disorder. Although CPTSD and human PTSD aren't identical, that doesn't mean the problem is any less real. Some 5 percent of deployed dogs in the American military, according to a New York Times story in 2011, develop CPTSD. These dogs undergo a variety of behavioral changes: They might become more vigilant, or shy or stop performing the tasks the military needs them to do. With medication like Xanax and training, dogs with CPTSD can lead more normal lives. But curing the condition is unlikely, Dodman tells the New York Times -- "Dogs never forget."